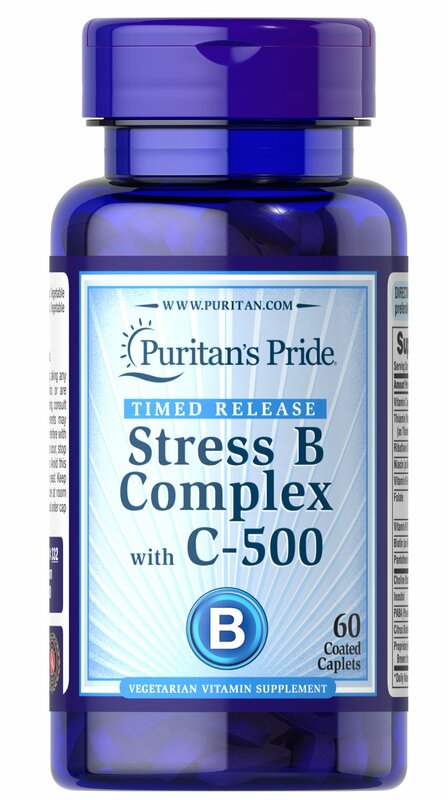 Timed-Release Stress Vitamin B Complex with Vitamin C 500 provides an excellent source of B Complex vitamins to help safeguard a sufficient daily intake. ** The B Vitamins, which are essential for the maintenance of healthy nervous tissue, each play a role in energy metabolism in the body. ** Choline and Inositol are essential components of cell walls and play important roles in cell growth and function. ** The 500 mg of Vitamin C is added to help support immune function. ** As an antioxidant, Vitamin C also helps to neutralize harmful free radicals in cells. ** Adults can take one timed-release caplet daily. No Artificial Color, Flavor, No Preservatives, No Sugar, No Starch, No Milk, No Lactose, No Fish, Sodium Free.